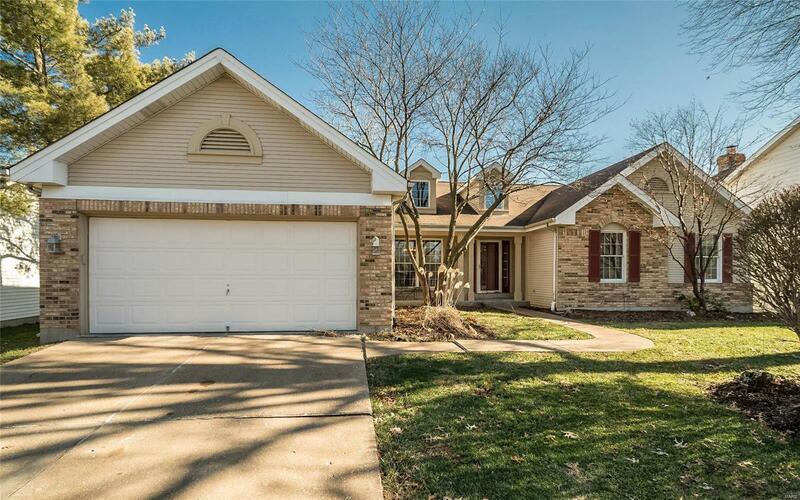 Smiles will come naturally when you tour this family-perfect 4BR/3bath, 3000sf ranch in Rockwood School District! Choice cuisine will come naturally too in the dazzling updated kitchen with SS appliances, custom cabs, granite island, tile backsplash & floor, vaults, updated lighting, desk & open view of the cheerful breakfast room where streams of sunlight start the day! The vaulted & beamed Great Rm has raised hearth f/p, 2 skylights, ceiling fan & pass through bar to Brkfst Rm. Perfect for entertaining! Formal Dining Rm & Den/Home office frame the entry foyer. Vault & beamed ceiling carries into the Master Ste and the bath features His&Hers vanities, jet tub & separate shower. 2 addl BRs, full bath & laundry rm complete main floor. Finished LL offers good-times design with huge rec rm w/walk-behind wet bar, full bath & 4th BR is being used as billiard rm. Composite party deck overlooks well-manicured common ground. Subdivision pool, tennis & walking trails. Grow your family here!